In Portugal, tremoços are the perfect snack. 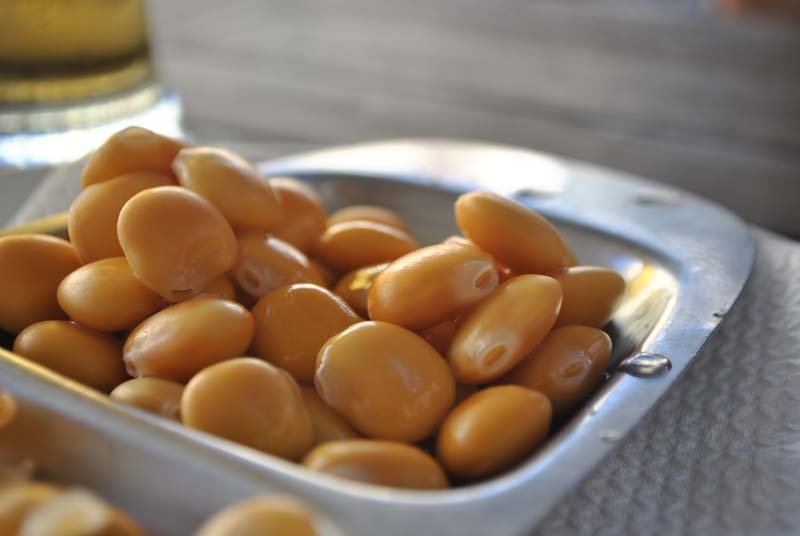 Tremoços, or Lupini Beans, are signature Portuguese small bite-size salty treats that are perfect for any occasion, and great for storing and eating whenever you have guests around. They are especially great when serving with a beer. While the ingredients and directions are very simple, tremoços take a bit of patience to make as they must be prepared over a couple of days in order to get the perfect taste. But when they are done, it is well worth the wait. Try it out and tell us what you think! 1) Soak the dried beans for 8 hours or overnight in a bowl with 4 cups of water. 2) The next day, cook them in the rest of the water in a saucepan on medium to low heat until tender, about 2 to 2.5 hours. 3) Once done, drain and transfer the beans to a bowl. 4) Drain, rinse and cover with hot water as often as you can, every 4-6 hours for about 2-3 days, until the bitter taste of the beans is gone. 5) Once the bitter taste of the beans is gone, place them into a jar with water and the two tablespoons of salt. 6) Store them in the jars with the brine for 2-3 days then serve. Once done, they keep for about two weeks. For those without the patience you can also easily buy some here on Amazon .